I love reading. It might be one of my all time favorite pastimes. However, since having Julia and Hannah, I’ve laid aside any active reading; taking up to two months to complete a book. Despite my slow and sporadic “pleasure reading”, I’m finding that my love of reading is rubbing off on Julia. I’ve made it a point to read to Julia daily (or at least every other day) since she was a small infant. She didn’t start really enjoying “reading time” until she was about a year. Now, she asks “read book” and if you’re not careful, she will have you read to her for well over an hour. This is especially true before bedtime – as a means of delaying having to go to sleep. There are few things I feel I do “well” as a mother. There are few things I feel that Julia doesn’t prefer to have her “Papa do”. So, to have her continuously say “Mama read book” makes me thrilled. It’s usually the one time in our day that it is just Julia and me; a time for snuggling, loving and reading. I love our reading time. *Julia’s face is so shiny because she has vaseline all over it to help with some major dryness and chapping. 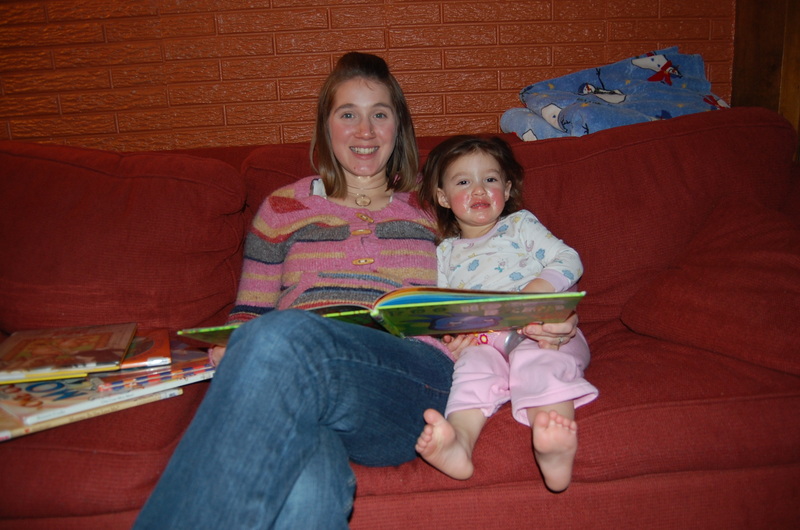 1 Response to "Reading Rainbow"
Correction, Sarah…there are a LOT of things you do really “well” as a mother! Thanks for laying your life down for these sweet girls…in a short time they too will be teenagers! 🙂 Also, have I told you lately what a blessing it is to have your family living with us?! ?